The May 2016 release of MAX Backup/ IASO 16.5 was posted to the MAX download and IASO download sites on May 10th and is scheduled to be pushed to the Auto Update Service by May 24th. Exchange Granular Restore Improvements include the ability to select an entire mailbox for restore and simplification of deployment through the removal of external dependencies on PowerShell and .NET framework. This feature was released for General Availability in version 16.4 and allows partners to perform granular item level restores for Exchange 2007, 2010, 2013, & 2016. Our Exchange Granular Restore technology is made available through a partnership with Lucid8. Please Note: Installation of Virtual Drive and a local Microsoft Outlook client on the Exchange Server are required. Other configuration and installation requirements can be found in the linked article and you can see it working in this quick video walk through. Virtual Disaster Recovery to VMware ESX Enhancements include the ability to use a direct mount of the VMDK file to improve performance when the restore instance of Backup Manager/Recovery Console and the target VM are hosted on the same datastore. Hyper-V VMs on SMB 3 Storage Support is introduced in this release, expanding the already supported DAS and iSCSI storage platforms. Expanded Support for Dynamic Disks during Bare Metal Recovery now includes the ability to convert dynamic disks to basic disk during BMR. Note that disks using an MBR partition table the total size of the dynamic volumes must not exceed 2TB. Web-Based Management Console Enhancements (Production Preview) in 16.5 we continue to add usability improvements such as visibility of the last login time, prompts to enter email addresses for existing credentials and notification of “Scheduled Maintenance” if the console is temporarily unavailable for login. This new console was first introduced in 2015 to supplement the existing Cloud Management Console and is targeted specifically at the needs of partners remotely managing end customer devices. The Web Console continues to evolve with each release providing partners with browser based access to add, delete, configure, monitor and manage backups from virtually any web based device without the need for a local software installation. The Web Management Console can be accessed securely athttps://backup.management/ and uses your existing Partner credentials. 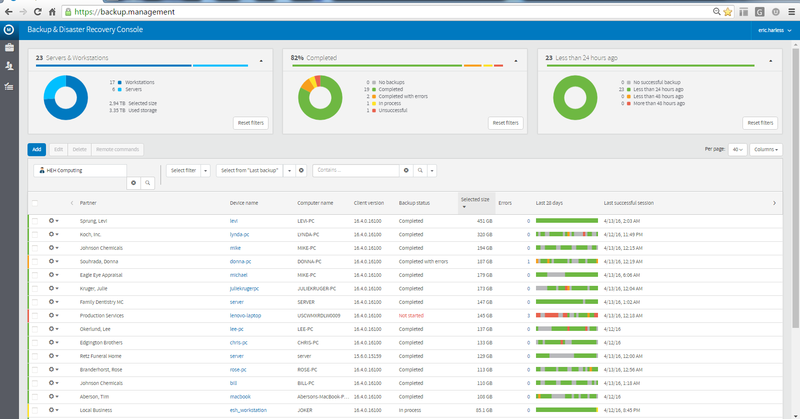 You may download the latest Cloud Management Console from the download section of our website. The latest release will also be distributed via our auto update server shortly following the initial release. Once available you will be notified upon launching the management console and presented with the option to update.